Since the turn of the millennium, there has seen an increase in the inclusion of typography, graphics and illustration in fiction. This book engages with visual and multimodal devices in twenty-first century literature, exploring canonical authors like Mark Z.
Danielewski and Jonathan Safran Foer alongside experimental fringe writers such as Steve Tomasula, to uncover an embodied textual aesthetics in the information age. Bringing together multimodality and cognition in an innovative study of how readers engage with challenging literature, this book makes a significant contribution to the debates surrounding multimodal design and multimodal reading. 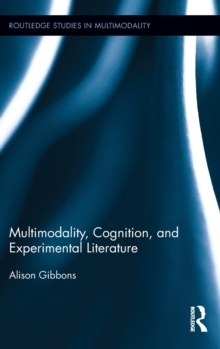 Drawing on cognitive linguistics, cognitive psychology, neuroscience, semiotics, visual perception, visual communication, and multimodal analysis, Gibbons provides a sophisticated set of critical tools for analysing the cognitive impact of multimodal literature.